I was doing my regular you tube surfing and came upon Scandalous Beauty's Billy B Contest. The winner is selected by Billy B and Erin and wins a set of Billy's Makeup brushes! These brushes look absolutely fab! We were directed to Billy B's Website to look at his portfolio for inspiration. This man has done makeup for everyone from Beyonce, to Pamela Anderson, to Missy Elliott, to Sharon Stone...everyone you can think of! There are so many drop dead gorgeous looks...very very pretty. However, I wanted to try something out there! I saw this picture below and it was one of the brightest looks in his port. Talk about edgy makeup! I decided to try to recreate the look with products I have at home. It took a couple of tries to get those lashes right! 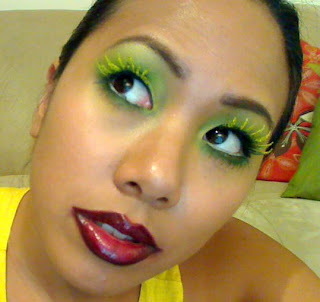 I ended up applying the lashes and then painting a mix of clear duo lash glue and yellow pigment on the tips. The glue helped to separate and spike the lashes as well as keep the pigment from wearing off. The other key thing about this look is to create a Joker type lip by drawing outside your lipline. Even if I don't win I had so much fun doing this. It's great to try new things and push past your comfort zone. Whoa, you really managed to replicate that look, really pretty! Hope you win! :-O I like yours better!!!! In the words of Ciara "you's a Go Girl"! Very pretty, you are going to win the contest with this look. You really recreated this look well! Good luck with the contest! this is an impressive imitation i must had! the lashes are great! hehe. Good luck! OMG! you did it!! soo pretty!!! Great Look!!! You did an excellent job. Good Luck with the contest!! you did such a good job on this look. it looks exactly like the model's! Wow! Fantastic job, even better than the photo. WOW!! It looks just like the picture. Great job!! Lovely look sis you hit it on point! I think you did a way better job! haha, sorry i've been MIA from your blog, these fires have been crazy! I miss you! awww sis! that look, you replicated sooo well!!! IT was like you were the one who did the original look! i'm so happy for you!!! You killed it girl!! Looks outstanding!!! Good luck!! Billy just created a follow up video about the contest! not bad!!! 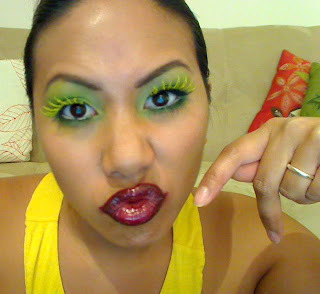 i know want to try it too lol butI dont have those lashes! great take on recreating that look - those lashes are craaaaazy!